If you do not wish to vote at this time, click here to visit Grophland stats. 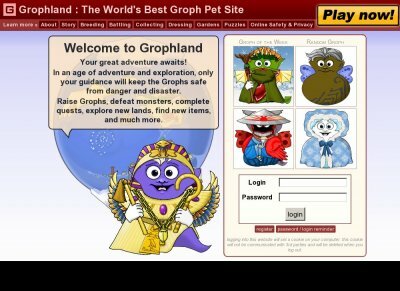 Grophland is a browser based Virtual World based around the creatures called Grophs and the Wurld that they live in. As an owner, a sort of spirit or minor God that looks after a community of Grophs, take part in Quests, Plots, Stories, Battles and more. Raise, breed, train and dress your Grophs, send them on missions, and collect thousands of items to enhance your Cave. Join Factions, find hidden places, and explore the Wurld. We have an active community, with forums, chat and private messaging. Members of staff are always around, and the owners are active and happy to listen to to suggestions. Indeed we encourage all forms of creativity, and accept artwork and writing submissions from players to expand the world.